We produce custom-printed water-slide decal markings for science fiction tabletop gaming miniatures. 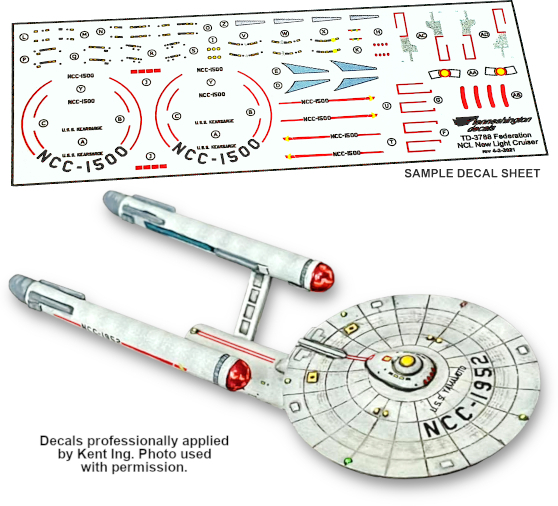 Our decals are designed to work with the 1:3125 scale Starline 2500 Miniatures produced by the joint-venture between Mongoose Publishing and Amarillo Design Bureau. Pricing and details on how to order are contained in the order form, below. 1) Please click the link to download and open our Order Form (Adobe Acrobat required). 2) Fill out the form with your information (including the custom names you desire). 3) Save the form to your computer. 4) Attach the completed form pdf file to an e-mail sent to our orders@tenneshington.com e-mail address. We will contact you within 48 hours to confirm receipt of your order and arrange payment. Please Note: Tenneshington Decals reserves the right to continuously improve the design, graphics, and materials of our products; Our decals are sold as-is, at the time of printing. We stand behind our products and we will replace any product that is defective or printed not-matching the information provided. Please take great care in filling out the form. We will reproduce what you type in, exactly. We will refuse to incorporate or print any names or other content that is deemed offensive. Tenneshington Decals will work with our customers to provide the naming they desire, but cannot and will not produce decals that would reflect poorly on us, ADB, or Mongoose. We thank you very much for your business and look forward to providing you with quality product and customer service. Questions? Comments? Let us know: E-mail Tony, E-mail Will, E-mail your order. Unique art and this website copyright © 2012, Tenneshington Decals; Will McCammon, Tony L. Thomas.